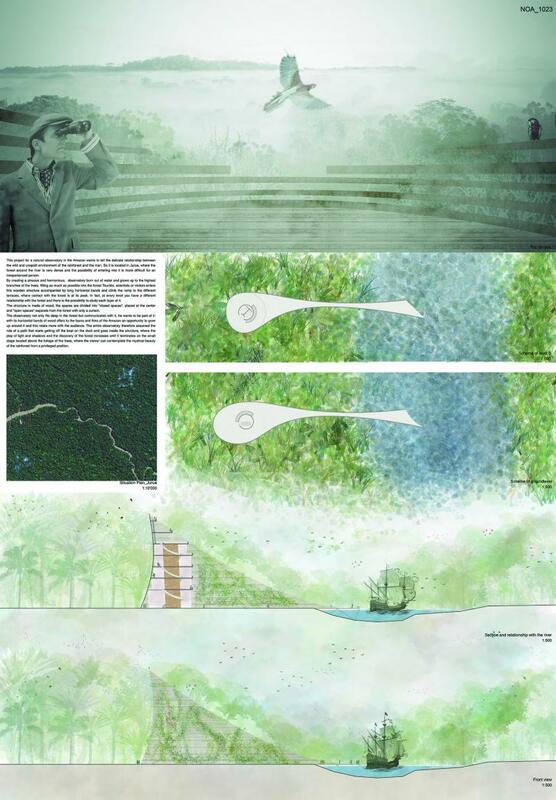 This project for a natural observatory in the Amazon wants to tell the delicate relationship between the wild and unspoilt environment of the rainforest and the man. So it is located in Jurua, where the forest around the river is very dense and the possibility of entering into it is more difficult for an inexperienced person. By creating a sinuous and harmonious, observatory born out of water and grows up to the highest branches of the trees, fitting as much as possible into the forest Tourists, scientists or visitors enters this wooden structure accompanied by long horizontal bands and climb the ramp to the different terraces, where contact with the forest is at its peak. In fact, at every level you have a different relationship with the forest and there is the possibility to study each layer of it. The structure is made of wood, the spaces are divided into "closed spaces", placed at the center and "open spaces" separate from the forest with only a curtain. The observatory not only fits deep in the forest but communicates with it, he wants to be part of it: with its horizontal bands of wood offers to the fauna and flora of the Amazon an opportunity to grow up around it and this relate more with the audience. The entire observatory therefore assumed the role of a path that starts getting off the boat on the dock and goes inside the structure, where the play of light and shadows and the discovery of the forest increases until it terminates on the small stage located above the foliage of the trees, where the viewer can contemplate the mystical beauty of the rainforest from a privileged position.